One of the challenges I looked at during the last PlaidCTF was 'drmless', and since I didn't see a write-up yet I thought it'd be nice to publish one. Again this is cross-posted on my blog and int3pids blog. cool_story.enc : A 'cool story' encrypted. cooler_story.enc : An even 'cooler story' also encrypted. drmless : an ELF binary. Here's a cool story from PPP! us if you want to unlock it. TEN THOUSAND DOLLAR. If we run 'drmless cool_story.enc' after extracting the archive on a 32 bit Linux machine we get a nice decrypted file. If we attempt to do the same on the cooler_story.enc file, we are told that this is a binary file and asked whether we want to view it anyway. Sounds like the 'less' program, doesn't it? So we have a file we can decrypt, and one we cannot. The objective is to decrypt the other one, presumably by altering the drmlicense or bypassing it in some way. Let's look at the binary to find out what's going on. So apparently 'drmless' uses this aes_wb_decryptor function to decrypt the data, and then XORs it with the license. It is interesting to note that only the input buffer is passed to the decryptor, which means that it either uses a hardcoded key or it is stored in some global variable. Also, it is interesting to note that the name indicates this is probably a whitebox implementation. This means the implementation is obfuscated in an attempt to withstand static/dynamic analysis, and most likely the key is mixed into the algorithm itself in some way. In any case, I have read documentation on whitebox cryptography before, and also analyzed some implementations of it. Based on that experience, I had some ideas on how to approach a whitebox implementation, but I also knew that I should probably focus on the stuff around the whitebox before diving into the whitebox itself. Just for fun, I look at the implementation and quickly saw that each round of AES is splitted into several functions, and they are all called sequentially. I also saw no global key seems to be input to the algorithm, so I started treating it as a decryption oracle and turned into the more interesting XOR with the license and its possible implications. This just decrypts the first 64 bytes of a file and performs some checks on it. If the checks pass, the function returns 1, otherwise it returns 0. At this point I strongly suspected this was all the protection that was to be found. So I decided to set my drm license to all-zeros, force the 'drmprotected' function to return 1 and dump the data into a file. I did this using this vtrace script and running it with the cool and the cooler story. The script still requires you to go through the whole output by pressing 'space' until reaching the end, in the same way you'd navigate through a file with 'less'. Last Friday I delivered a presentation at Insomni'hack about embedded security on how to break 'modern' embedded systems using fault injection and side channel analysis. In this post, I will summarize my presentation and provide links to additional reading material and, when possible, open source software/hardware references. 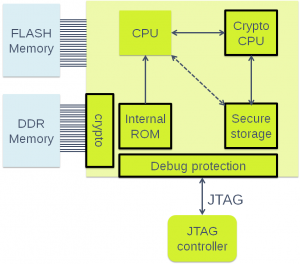 Traditional embedded systems are awfully insecure in a hostile environment: they usually run unauthenticated code from flash/rom memories, contain a JTAG debugging interface allowing runtime control, etc. In addition to the lack of runtime protection, traditional systems store data in flash-like memories either in the clear or encrypted with a key that you can also find in the firmware. - Secure Boot: this mechanism refers to a device that boots from internal code (e.g. an internal boot ROM) and performs some kind of authentication of the firmware to be loaded on the device. Obviously, for this to work the system needs to guarantee that the internal boot ROM cannot be easily tampered with and that code is properly authenticated. - Secure data storage: in order to protect sensitive data, modern devices often include a secure storage in the form of some internal flash or One-Time-Programmable (OTP) memory. Access control rules are implemented on this storage in order to ensure sensitive data is only accessible to those parts of the chip that require it. - Key stores: As a specialization of secure data storages, key stores allow the system to securely store cryptographic keys. Often these stores allow the main CPU to write keys into them and to instruct the on-chip cryptographic coprocessors to use them. Therefore, in this way keys remain secret even if one achieves runtime control of the system. - Memory protection: Many modern systems implement a protection mechanism for their main DRAM memory. In order to avoid attackers from reading data off RAM chips, sniffing the bus or modifying the data easily, they implement DRAM scrambling / encryption mechanisms. These mechanisms are usually quite weak due to timing restrictions, but nonetheless pose some barrier to the attacker. - Debug interface protection: In addition to the above, debug interfaces such as JTAG are not (supposed to be) left open on secure systems. Since usually the system developer wants to be able to debug the target during development time and in case of errors, the most common solution involves setting up a password protection scheme. 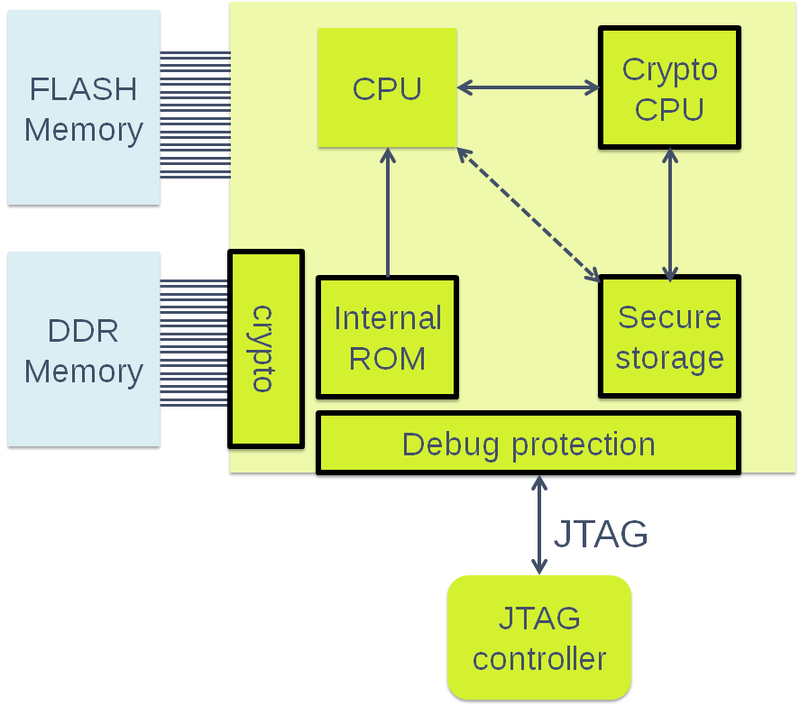 Thus, the JTAG interface is usually locked until a password/key is presented in some way. This can be either a hardcoded key, device-specific key, or even a challenge-response protocol. The remainder of the presentation (and thus this post) focuses on how to get to these secret keys starting from a device implementing all these mechanisms. Of course, depending on how well these mechanisms are implemented, it might be very well possible to achieve this by means of logical attacks (e.g. overflows, improper bound checking, etc.). However, for the sake of argument we are going to assume that this is not possible and see what we can do at the more physical/hardware level. Say we have no easy external interface providing unauthenticated data to the target that we can exploit (i.e. no browsers, no networking, no filesystem parsing... ). What do we do? If you have been reading this blog before, you probably know I am thinking about fault injection. As I described in that post, we can make a device fail by bringing it just outside its normal operating conditions. This can be achieved by modifying the voltage supply to introduce short glitches (aka VCC glitching), by injecting optical energy (laser/optical fault attacks), EM energy, etc. Now, if we time our faults precisely at the moment when the internal BootROM is verifying the integrity of external code, we might be able to bypass it and run unauthenticated code. In absence of specific countermeasures, it is almost always possible to achieve this. Therefore, it is important to implement appropriate protection and detection mechanisms in order to guarantee the integrity of boot code. See this post for references on how to do this. Also, keep an eye on Die Datenkrake, which promises an open source hardware and software design that can be used for fault injection purposes amongst others. So once we have runtime control of the target, we are usually allowed to encrypt/decrypt data at will. However, what we really want is to obtain the key so we can share it with our friends, sell it to the highest bidder, or just post it on twitter for the lulz. So again, if we cannot find an easy way to obtain the keys through logical means, we will resort to side channel information. We can do this in two ways: by monitoring the chip or by injecting faults on it. When a chip is functioning, information about its operation is leaked to the surrounding environment. Think of it as hearing stuff that you are not supposed to be hearing (e.g. what your neighbours where doing last night 😉 😉 ). Even though you are not supposed to hear it, you actually do hear it. So you know what they are doing, and you make assumptions about what's happening in there. The same happens with chips. When a chip is functioning, it takes more or less energy from the power supply depending on what it is doing. It also takes more or less time to compute, creates stronger or weaker EM signals (remember tempest?) around it or emits tiny photons depending on the activity it is carrying out. Now, this activity is of course related to the process it is performing (e.g. encrypting some data) but also to the data it is using (e.g. input data, keys, output data...). So what you do is you ask the chip to use that precious key he is not willing to show to you, and you monitor it while it is doing so. Kind of like the polygraph tests three-letter-agencies like to perform on super-bad terrorists. How do we link this to the keys you are asking? Here is the trick: we ask the chip to perform lots of operations with the key using random input data. At the same time, we record side channel traces (let's say power consumption traces, using an oscilloscope). Now, due to the fact that the power consumption is linked to the data used for the computations (and thus the key), we will use statistics to find out what the key is. What we do is we split the key in small chunks used by the algorithm (e.g. in DES 6 bits of key are mixed with 6 bits of data and fed into the S-boxes). We refer to these internal results as intermediate values, and we create a model of how these values will leak to the power consumption. For instance, we assume that the Hamming Weight of these values is leaked in the power consumption. This means that whenever these values are computed, the consumed power varies depending on their HW (and probably also other variables). Now, since there is a dependency between the intermediate values and the power consumption, we can use statistics to find out the amount of dependency. Since those intermediate values depend on small chunks of key, we can try all the possibilities and find out how much statistical dependency there is between the power traces and those intermediate values. The key guess showing more statistical dependency will probably be the correct key. If we repeat this process for all the key chunks, then we obtain the whole key. Now you might be asking... how do I do this at home? Well, if you are a security test lab you can buy products like Inspector (from my employer ;-p ) or CRI Workstation. But if you are not, you can take a look at this page which contains information from a presentation delivered at BlackHat EU 2013: http://www.newae.com/blackhat. You can also take a look at OpenSCA, a Matlab-based framework for side channel analysis. So as I said above we can also get keys through fault injection. Depending on how the system is designed, it might be possible that the memory cells containing the keys are actually mapped in the memory space of the system. In those cases, an access control mechanism is placed in between the bus initiators and the bus target (i.e. the memory itself) in order to identify whether the request is allowed or not. As you can imagine, glitching this access control check would result in access to the secret keys for initiators that should otherwise have no access to them. But sometimes you won't be as lucky and you won't have the ability to request a read of the key (even if it was denied) and attempt to bypass the access control checks... simply because the key is not mapped anywhere in memory. What do you do then? DFA is the answer, my friend. With Differential Fault Analysis you can inject faults into the cryptographic algorithm itself, and by observing the changes in the output you can recover the secret keys. See this post for more information. As you can see, when a device is under the control of an attacker (aka user in some cases ;-p ), there are a number of attacks that need to be considered in addition to the usual software/logical vulnerabilities. By abusing environmental variables such as power/energy supply and consumption, radiation, etc. one can exploit hardware that would otherwise be secure. Therefore, as an embedded system designer it is important to protect your code and hardware. Even in the presence of countermeasures, it is critical to test those countermeasures and verify that they actually do what you intended them to do (the company I work for can help you there 😉 ). In order to protect against SCA attacks, you need to make the environmental variables statistically independent of your secret data or hide that dependency somehow. You must know that most countermeasures are covered by CRI's patents, so you might want to check with them before you implement them in your products. In order to protect against fault injection, you need to introduce redundancy in your computations and make your software AND hardware resilient to induced errors. You can take a look at this paper for some ideas on how to do this at the application level. Additionally, for more reading material on the subjects you can take a look at CHES (mostly side channel analysis) and FDTC (mostly fault injection) from the last couple of years. The DPA book is also a very good read with lots of background information on DPA attacks. Of course, if you have any concrete inquiries you can address me in the comments, on twitter or elsewhere. Because of this, I thought it was interesting to share and maybe request some feedback... who knows, maybe there are easier solutions and I am just complicating my life 🙂 You can also find a copy of this post at int3pids.com. In that post, I explained how to extract keys from cipher implementations assuming we could somehow inject faults during the execution of the cipher. Besides DFA attacks, I also said we could achieve something similar to what we do with software protections (i.e. modifying control flow, bypassing checks, etc.) using fault injection techniques. I thought it was worth giving a few examples of how to inject faults in real hardware to complete the picture. When hardware is designed, it is engineered to work under certain conditions of temperature, input voltage ranges, clock frequencies, etc. The hardware is tested under those conditions and is supposed to function in that range... and there are no guarantees that it will operate correctly if you bring it outside them. I guess you follow my reasoning already 🙂 So if we want to inject faults into hardware, a good place to start looking is exactly in those gray areas around the operating conditions. Of course, we want the chip to be functioning properly most of the time, and we want it to fail at the precise moment at which it is computing something sensitive (say a secure boot check, or an RSA-CRT signature). Thus, we probably need to have some control over the timing, and inject the fault only temporarily. In this post I am introducing from an intuitive perspective three ways of injecting faults: voltage, clock and laser/optical glitching. The first example I want to touch on is that of voltage (or VCC) glitching. In this case, we typically run the chip at its nominal voltage (say 3.3V), and whenever we want to inject a fault, we drop voltage down to e.g. 1V. 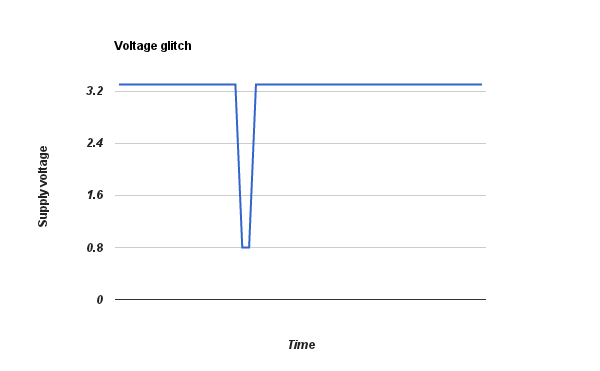 Example of voltage glitching. The supply voltage is set to 0.8V during a short moment of time. At this moment, the input voltage to certain gates within the chip will be too low due to the lack of supply voltage. Thus, these gates will receive an input voltage which is below the threshold that indicates whether the signal is a zero or a one, no matter what value it was supposed to be. Then we increase the voltage again to the nominal voltage of 3.3V, and we have a functioning chip that just failed to execute one of its operations. For instance, it failed to execute a conditional jump and fell through to the code that we wanted to have executed. The trick here is to find the proper parameters for the glitch: voltage drop (do we go to 0V, to 0.4V, to 1V ...), length of the glitch (a few nanoseconds, a few microseconds?) and the timing. Typically, if voltage drop and length of glitch are too small, the chip will function properly. If they are too large, it will just die (mute, reset, or maybe even physically damaged). Of course, if the timing is wrong then the attacker will never see the effects he wants to see. As a protection against this kind of glitching, most modern smart cards and some embedded devices incorporate voltage sensors that detect whether the voltage went below a certain value or not. However, this attack is still effective against a wide range of products. 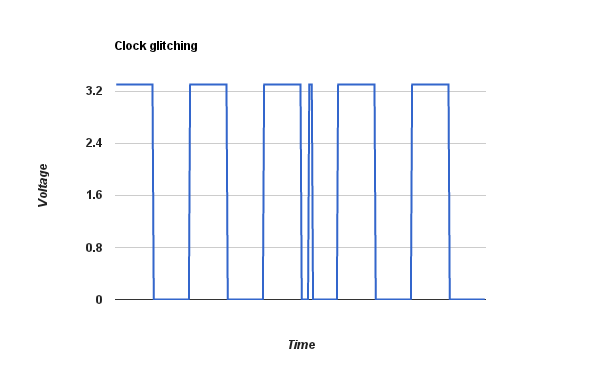 Clock glitching is similar to VCC glitching in the sense that it affects another critical parameter of the chip that can be controlled by the attacker. In this case, what we do is injecting spurious clock cycles that are way shorter than the original clock cycle. Example of clock glitching. A very short spurious clock cycle is inserted at the beginning of a normal cycle. Since the internal logic of the chip operates based on its clock, a short clock cycle will trigger a new operation before the results of the previous one were completely computed or propagated through the device. Imagine you have to multiply two values, and then add a third value to them. Normally, multiplying values takes longer than adding them up. Thus, the clock frequency for a chip that only performs these two operations would be long enough for the multiplication to occur and its result to be ready at the input of the next stage, since that is the critical operation. Now, if I tell you to start adding up before you received the multiplication result, you will be using invalid (old?) data instead of the correct result. Thus, you will fail at computing the correct result. Clock glitching exploits exactly that situation. Again, finding the right parameters in this case is the key to success. As for hardware level protections, frequency sensors as well as using internally generated clocks (using on-die oscillators) are generally the most common ways to protect against clock glitching. Additionally, fast clocks make these attacks less practical for attackers, since they need to inject even faster clock cycles and synchronize their attack at a higher speed. This is why clock glitching is less effective nowadays: most high-end smart cards use their own on-die clocks, and embedded systems require much higher clock speeds. After clock and VCC glitching, we move to the real king of current fault injection attacks. Optical fault injection, or most commonly Laser fault injection, uses a light beam to inject faults into semiconductor devices. How is this possible? Well, light (physicists, don't kill me!) basically consists of a number of photons carrying a certain amount of energy. Roughly, when these photons reach a semiconductor (typically silicon in electronic devices), their energy is absorbed by the semiconductor. Given enough energy, electrons that would otherwise be still within the semiconductor will start to move, creating current. So, for our chips, this means that some of the transistors in the chip will actually switch when they should not! The big difference between this fault injection technique and the previous ones is that in this case we actually have spatial selectivity (or resolution): we can choose which parts of the chip we attack by pointing the laser beam to them. Of course, this is very powerful but at the same time it adds extra complexity to the attack: now you need to find the sensitive spots in the chip. As before, there are a number of parameters one needs to play with in order to successfully inject faults: glitch timing, glitch length, wavelength of the injected light and amount of energy injected. Also, this attack is semi-invasive: we need to open up the chip package so that the light radiation can reach the die. Otherwise, the light will be blocked by the package or the plastic around the smart card die. Thus, this attack provides additional power at the cost of additional complexity, as usual. In terms of hardware level protections, this is also the most difficult attack to prevent. Typically light sensors are scattered around the chip, but manufacturers cannot place sensors everywhere (that's expensive!) so there is always open spots. At the end of the day, fault injection protection requires a combination of hardware and software prevention and detection mechanisms: typically sensors at the hardware level and double-checks and redundancy at the software side. Due to the difficulty of completely preventing this kind of attacks, fault injection attacks are nowadays one of the main threats to secure hardware. Additionally, this difficulty together with the physical nature of the attacks also means that simulating them is typically not enough to assure appropriate protection levels, making fault injection testing key for secure hardware. Differential Fault Analysis (DFA) attacks are part of what is known as fault injection attacks. This is, they are based on forcing a cryptographic implementation to compute incorrect results and attempt to take advantage from them. With fault injection attacks (also often called active side channel attacks) one can achieve things like unauthenticated access to sensitive functionality, bypassing secure boot implementations, and basically bypassing any security checks an implementation performs. With DFA attacks, one is able to retrieve cryptographic keys by analyzing correct/faulty output pairs and comparing them. Of course, this assumes you are able to inject faults somehow... which is often true in hardware implementations: gaming consoles, STBs, smart cards, etc. At the software level, one can achieve similar things by debugging the implementation and changing data or by patching instructions... but this is something we have been doing for a long time, haven't we? 🙂 I often say that fault injection attacks are the analog version of 'nopping' instructions out in a program, although we often do not know exactly what kind of faults we are injecting (i.e. we often miss a fault model, but we still successfully attack implementations in this way). There are ways to protect against this kind of attack as an application programmer, but this is not the objective of this post. In the remainder of this post, I will explain two powerful DFA attacks on two modern cryptographic algorithms: RSA and (T)DES. For some information on protecting from these attacks as a programmer, take a look at these slides. If there is some interest, I will outline the most common techniques to perform fault attacks in a future post. After a long long while, it's time to go on with our crypto series. 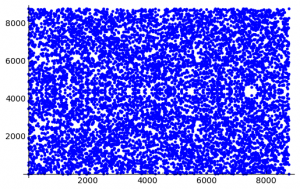 Last time we talked about the RSA cryptosystem, and we learned its security is based on the integer factorization problem (plus the DL problem for message secrecy). Today, we'll continue with public key cryptosystems: we'll look into Elliptic Curve Cryptography. As you can see, if you want to add two points P and Q, you draw a line through them. The intersection of this line and the curve is the point -(P+Q). Then, you just need to invert this point (negate the y coordinate) to obtain the final result. Of course, we have special cases. 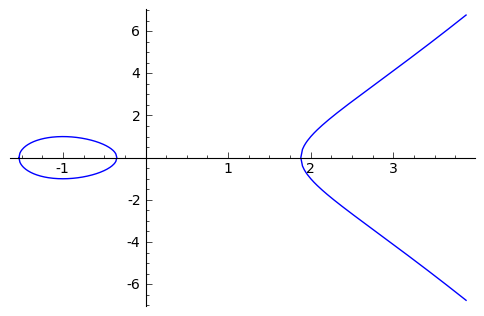 If the point is added to itself, the line is defined as the tangent to the curve at that point, as intuitively the tangent touches 'two times' the point. If we add a point to its inverse, we get a vertical line... and that's a problem because it will never touch the curve. Here is where the point at infinity comes to rescue. The point at inversity is simply 'up there' (and 'down there'), and is the zero element of the group. 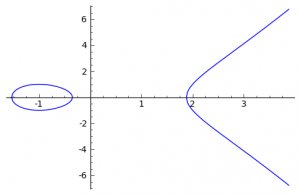 We have defined above how an elliptic curve looks like over the reals, and how to perform additions of two points. Obviously, when addition is defined we also have multiplication for free: just add a point to itself several times in a row (although you can do it in smarter and more efficient ways). Given a curve E and all its parameters, a base point P and a point Q=nP, obtain n.
And how is this difficult in the curves defined above, you might be thinking... The truth is we do not use real curves in ECC, but we use curves over finite fields instead. We can do it over prime fields GF(p), or we can do it over binary fields GF(2^n). I'll look only at GF(p) here, but similar concepts apply (although the simplified expression I defined above is slightly different in that case). Now you might be wondering... why do we use Elliptic Curve cryptography at all? What are the benefits? The answer is that the ECC allows us to use smaller keys than other algorithms like RSA / 'normal' DL systems for the same amount of security. This is because the best known general methods for solving the DL in Elliptic Curve are of exponential complexity, while for the other systems we know subexponential methods. Hence, the DL problem under Elliptic Curves is believed to be more difficult than the equivalent base problems for other public key cryptosystems. So, if you remember from when we talked about Diffie-Hellman, this is a key exchange protocol that relies on the Discrete Logarithm problem (and the Diffie-Hellman assumption). Usually this is done over a finite field GF(p), but now we have just defined a group based on Elliptic Curves which we can use as well. In this case, Alice has a private key and a public key , where G is the base point. Similarly, Bob has and . Alice and Bob exchange public keys, and then each of them can compute a common point . This protocol relies on the assumption that the DL problem is infeasible in the elliptic curve (which requires a base point G of high order) and the Diffie-Hellman assumption. Besides the EC Diffie-Hellman algorithm defined above, there are several other algorithms based on Elliptic Curves. For example, one could compute digital signatures using Elliptic Curve DSA or Elliptic Curve Nyberg Rueppel. Each algorithm has its own details, but the important problem used as a foundation for each of them is the Discrete Logarithm problem over Elliptic Curves as we have defined it here. Beware, however, that similarly to other algorithms, ECC algorithms rely also on other conditions. For example, for ECDSA (and DSA) there is a secret parameter that must be unique, and two signatures with the same value for this parameter will reveal your secret key. As usual, if you implement cryptography. you need to be aware of the requirements and limitations or you will certainly screw up (toc toc SONY!). Somewhere before the weekend I was discussing about Padding Oracles with a friend and somehow it came up that there was no public tool using timing information for this kind of attacks. I had seen that Thai and Juliano mentioned timing leaks in their talk at EkoParty, but since AFAIK there was no public tool available I decided to look into it. Also, some weeks ago I added the CBC-R encryption part to my scripts, in order to be able to encrypt arbitrary information as long as we are able to control the IV. So in this post I'm going to write about these two things: CBC-R encryption and a web based padding oracle attack script using timing information. I wanted to share with you guys the little challenge I prepared for the Campus Party Europe. The wargame was organized by SecurityByDefault and took place during the last couple of days. I was asked to prepare a cryptography challenge for it, and I delivered a little problem that became the level 4 challenge in the crypto category. The problem is based around RSA with 2048 bit keys and AES in ECB mode with 128 bit keys. The idea was to give some real crypto instead of the typical break-classic-crypto or find-the-needle-in-the-haystack challenges. Of course, I am not asking you to factor an RSA-2048 modulo (well, I am, in a way...) nor breaking AES in a mathematical sense because that is not feasible nowadays. You have to find the trick ;-). Want to challenge yourself? Give it a try! I'll leave the challenge here, and the solution will be published in SecurityByDefault in some time. If you have questions or want to share ideas with me you can use the comments, but please do not spoil the solution for other readers! Unfortunately, the team was not able to obtain the private RSA key nor decrypt the AES file. It is critical for the mission to obtain the contents of the encrypted file. Your task is to obtain the contents of the AES file. PS: All RSA operations are RAW operations. This means no padding, just modular exponentiation. 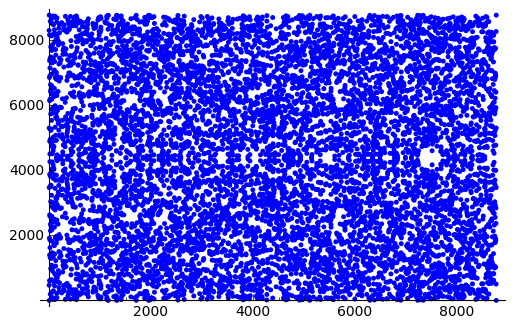 For keys smaller than the modulus, the padding is null (i.e. zero bytes). And the file encrypted with AES can be found here.